From Victoria Station, you can take the District Railway to Monument Station, where you can visit the statuary ensemble with the same name. The Monument is a high column of stone, built to commemorate the great fire which occurred in 1666. Not far from here, about a 15-minute walk, is located one of the most visited sights of the Capital, St Paul’s Cathedral. Built in the seventeenth century, on the site of an old wooden church that burned in the great fire, the current cathedral witnessed over time some outstanding religious events. Here is where the funerals of the Duke of Wellington, Lord Nelson and of Sir Winston Churchill took place. Also, the religious ceremony of Prince’s Charles and Lady Diana wedding was also held in this cathedral. The landmark has a crypt, which is said to be the largest in Europe, and it houses the remains of some prominent Englishmen. Here is where Admiral Nelson, the Duke of Wellington, Sir Alexander Fleming (the inventor of penicillin) and the famous architect Sir Christopher Wren, who designed the current cathedral, “rest”. It is also worth mentioning that the cathedral’s Dome is one of the largest in the world, and it is surpassed only by the one from St. Peter’s Basilica, in Vatican. Also, one of the two towers of St Paul’s Cathedral, houses the largest bell in London called the “Great Paul”, weighing no less than 17 tons. If you decide to travel by transfer from Luton Airport to St Paul’s Cathedral, you can use a company like 247 Airport Transfer. A journey by transfer will last almost 1 hours and 19 minutes. The price for a transfer service from Luton Airport to St Paul’s Cathedral starts from 57£ for a Saloon car. You can get a 10% discount if you register on 247 Airport Transfer’s Website. Walking on a boulevard, which is flanked by numerous modern buildings that are almost parallel with the River Thames, you get in the area of Tower Hill tube station, where you can visit the ancient Roman ruins of nearly 2,000 years old. 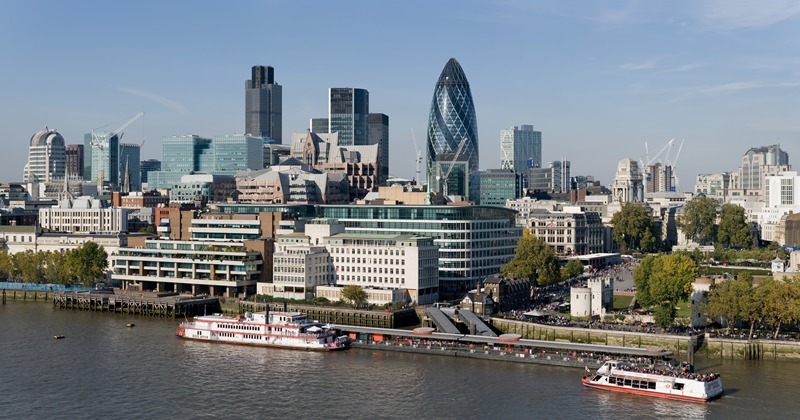 A place that is also worth visiting is the City of London, an important economic center of London, also known as the Financial City. The main financial center of the Kingdom is one of the largest in the world, together with the one in New York City. Walking the streets of that area, you have the opportunity to admire the impressive buildings that host banks such as: Bank of England, Lloyd’s and RBS subsidiary. The RBS, also known as Royal Banks of Scotland, used to have representation in Romania, as well, but unfortunately in March 2013 the management team withdrew its subsidiaries from all the cities, leaving only three for the recovery of debts. Another impressive building of the financial center is the subsidiary of a Swiss insurance company, officially known as 30 St Mary Axe. The locals also call it Swiss Re Tower, which also happens to be one of the tallest buildings in London. 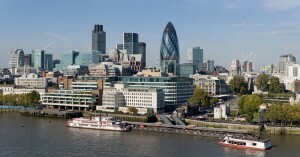 The giant “skyscraper” built of concrete, metal and glass, is visible from almost all locations from Central London..